Shafted! 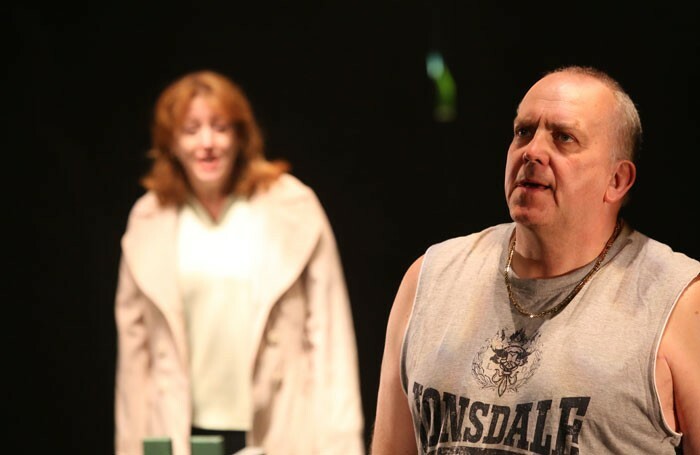 is John Godber’s first stage appearance since a production of April in Paris (also with his wife Jane Thornton) in 2010 with a sell-out show at Hull Truck Theatre. The playwright/performer exhibits superb comic timing and a wonderful rapport is built up in this crafty two-hander. The miners’ strike may be familiar to theatre audiences through the likes of Billy Elliot, Brassed Off and more recently Red Ladder’s We’re Not Going Back, but Shafted! Is the first to look at the debacle’s aftermath in the north. When striking miner Harry and his supportive wife Dot first enter the stage with the house lights still up, there is a pro-strikers’ chant that sounds as fresh now as it did back in that ill-fated year of 1984. However, this show is far from nostalgic: there is a gritty warts’n’all realism and underlying anger, although that bitter pill is sweetened by the fast-paced comedy, albeit a pitch black humour. The focus of the dialogue is to conjure up a post-pit raison d’etre. The narrative slowly unravels with Harry becoming increasingly slobbish and demotivated as the years go by while Dot is trying to pull out all the stops to avoid a life of abject poverty. Godber gives us two astutely observed, clear and clever character studies. Particularly strong are Dot’s monologues direct to audience that reveal her dogged determination as well as her fears and frustrations.